Okay, now just bear with me here. I know this may not sound appetizing, but this is maybe one of the most delicious and refreshing salads I’ve ever had. It’s simple, healthy, and perfect for a hot summer afternoon. 1. Prepare tabouleh according to package directions (usually soaking the mix in boiling water for at least 30 minutes). 2. When tabouleh has set, remove from fridge and fluff with a fork. 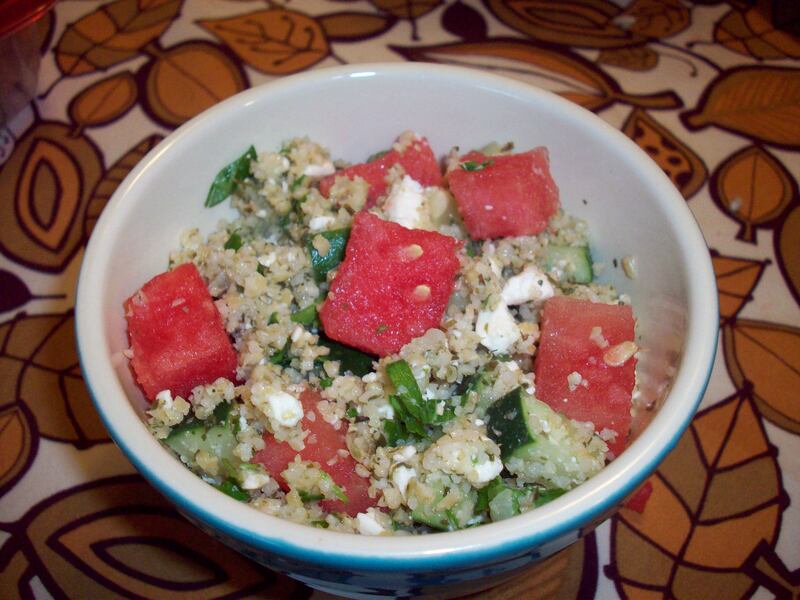 Add olive oil, parsley, cucumber, feta, and watermelon. Stir until incorporated. Sprinkle lemon juice over the salad and stir once more. Let the flavors marinate overnight, or at least for 1-2 hours. Serve as a main dish, side dish, or use it in a lettuce wrap. The possibilities are endless!